Have you ever wondered why kilts and bagpipes became part of fire fighter traditions? A huge wave of Irish immigrants hit the eastern United States in the 1840s. Facing massive discrimination and signs that read “No Irish Need Apply”, often the only jobs they could get were extremely dangerous and often deadly – fire fighters and police. Their Celtic traditions became part of fire fighter culture. But they switched from traditional Uileann Irish pipes to larger Great Highland bagpipes because they were louder. 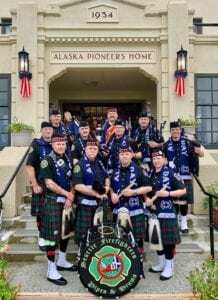 Many WSCFF members belong to pipes and drums groups around Washington State. Visit these Facebook pages for more information: Puget Sound Firefighters Pipes and Drums, Bellingham Firefighters Pipes and Drums, Spokane Pipes and Drums, and Seattle Firefighters Pipes and Drums to find out more about specific events. Happy St. Patrick’s Day to all!